Sabre KR14OC Key Ring Key Ring 3.75 H x 7|8 in. W .54 oz 8-10 ft in. 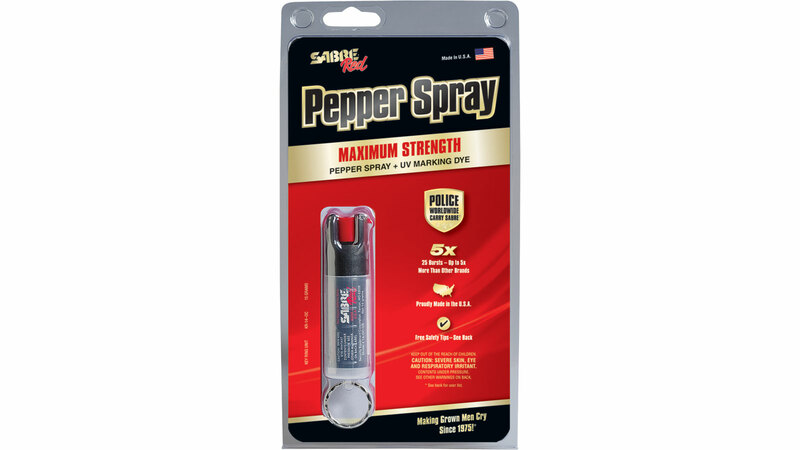 The Sabre Key Ring selfdefense pepper spray provides security in a simple compact cannister with key chain attachment. The 0.54oz Key Ring delivers a ballistic stream which reduces wind blowback and the compact cannister provides approximately 25 shots of pepper spray with UV marking dye within a range of 10 feet. SSI 30891 features pepper spray with red UV marking dye. SSI 25772 and SSI 30884 feature the Quick Release system where the detachable key chain allows immediate access to the defense spray when unlocking a door or driving an automobile. In addition SSI 30884 is a combo kit that also includes a practice cannister and thorough practice instructions.